Beckhoff EtherCAT Terminal system will be extended with new I/O terminals. With the EL3602, Beckhoff, also known as Beckhoff Automation , offer a new generation of high-precision analogue equipment. The measurement readings are sampled with a resolution of 24 bit and accuracy within ±0.01%, providing an optimal basis for high-performance and high-precision measurement technology. This seamless integration of measurement technology into the automation solution makes separate specialised components unnecessary. Beckhoff refers to the integration of engineering functions that go beyond traditional PLC and motion technologies into the automation software as scientific automation. It builds on the increasing performance of PC-based control technology and a fast communication system such as EtherCAT. A prime example of scientific automation is measurement technology, which up to now has been performed by specialised devices for many high performance applications. The EL3602 EtherCAT Terminal enables measuring signals to be sampled directly in a standard I/O system. The analogue 2-channel EL3602 input terminal handles signals in the range between -10 and +10 V. The voltage is digitised with a high resolution of 24 bit. The high precision of 0.01 % at 25 °C enables the execution of high-precision measuring tasks, at a machine or for test rig automation, for example. With XFC terminals (eXtreme Fast Control Technology) for oversampling and time stamp technology, Beckhoff already offer solutions for good performance requirements. The new terminal generation for high-precision measurement technology also offers better accuracy. The high-performance EtherCAT Terminal system is a modular I/O system consisting of electronic terminal blocks. The EtherCAT protocol is maintained right down into the individual terminal. An I/O station consists of an EtherCAT Coupler and almost any number of terminals (up to 65,535 devices). 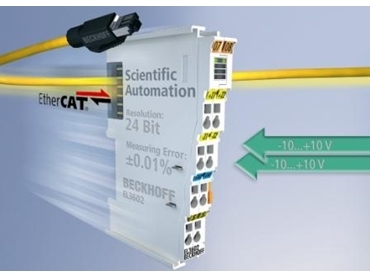 EtherCAT Terminals are available for all common digital and analogue signal types encountered in the world of automation. Fieldbus devices, e.g. for PROFIBUS, PROFINET, CANopen, DeviceNet, Interbus or Lightbus, can be integrated via local fieldbus master/slave terminals. Any Ethernet device can be integrated locally through switch terminals.